CORN DAYS ARE HERE! Enjoy a free dozen ears of Harward Farms sweet corn with $10 purchase! If you took a stroll through your garden right now, what would you find? Late summer blooms? Bees, butterflies, hummingbirds? Colorful veggies among over zealous vines? Weeds? My little garden patch is small, nothing like the prolific garden plot my grandfather rightfully took pride in but I'm enjoying all of the above! I currently have cabbage, eggplant, cucumbers, enough summer squash and zucchini to feed a small village and my favorite heirloom tomatoes. Yesterday wasn't spent in my garden however, it was spent in my sewing room busily preparing for the Christmas Figs BOM (It's going to be fabulous, by-the-way!) My husband, knowing I was happily lost in sewingland (and in a time crunch) made the most wonderful dinner for our family. I've said it before, and I'll say it again, I have the best husband. On the menu: smoked sirloin, wild rice and his own beautiful mix of roasted veggies straight out of the garden. Oh. My. Gosh. Mouthwatering garden goodness! The only thing that would have made the meal more complete would have been an ear of fresh sweet corn. Alas, unlike my grandfather, it is the one veggie I can't seem to grow. So, like many of you locals, I'm looking forward to tomorrow when we celebrate CORN DAYS here at the shop. Saturday, August 18th, we'll give you a coupon for a FREE dozen ears of Harward Farms Sweet Corn with your purchase of $10 or more in merchandise here at the Corn Wagon Quilt Co.! Do you think if I brought home a dozen and hid myself in my sewing room, my handsome husband would make another winning summer dinner? I'll keep you posted. CORN DAYS coupon redeemable only at the Harward Farms produce stand across the street from our shop near the corner of 400 S 400 E during business hours 08/18/18. 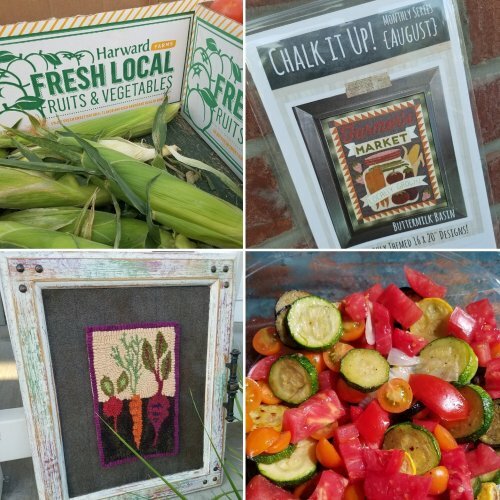 Clockwise from top left: Harward Farms sweet corn fresh from the wagon; Farmer's Market wool applique pattern from Buttermilk Basin, handsome husband's garden veggie medley, Vegetable Garden rug hooking made my Marianne Michaels from a punch needle pattern by Threads that Bind. Don't you love the creative framing in an old cupboard door? Kits available! CAN'T GET ENOUGH GARDEN GOODNESS! 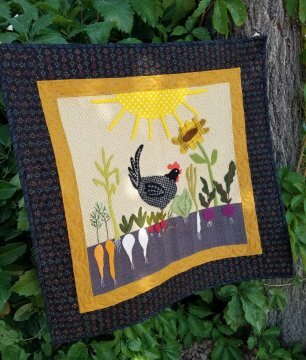 Norma Whaley invites you to take a Stroll Through the Garden with WOOL in this summer wall hanging. We have patterns & kits at the shop! If you've always wanted to learn more about the art of wool applique we have a FREE wool applique demo coming up, Tuesday, August 28th at 1:00 pm here at the shop. Stop in for an hour of instruction from our wool expert, Marianne Michaels. Once you see just how easy wool applique is to do, you will be excited to start your own project! Local design favorite, Sarah Jane Studios has brought this classic fairy tale to life with her delightful signature style. Peter Pan leads Wendy, Michael and Jon Darling soaring across a playful border print. Captain Hook and Mr. Smee are looking to duel and perhaps my favorite print in the collection, Tinkerbell flitters with a bit of gold pixie dust. In stock now at the shop! Nebo Modern Quilt Guild Meeting 10am - Noon in our shop classroom. Hello Pouch Class 10am - 1pm at our Retreat Center, 385 S. 400 E. Springville. Christmas Figs Block-of-the-Month Class 11am - Noon in the shop lower level. 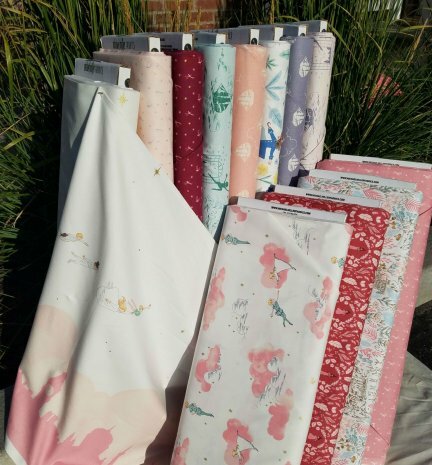 August 20th - 25% off FLANNEL including all regular price yardage and hemstitching kits!